If I ever get married again, I hope my future wife is at least half as amazing as "Bride of a True Geek," who sends pictures and a delicious description of the wedding cake she had made for her husband-to-be. 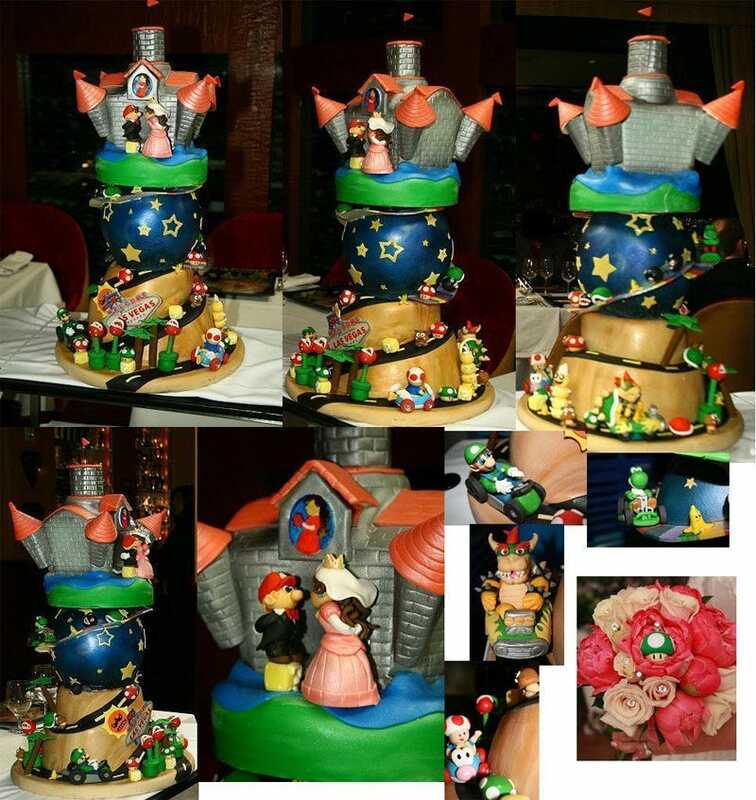 Not does the cake look and sound absolutely amazing, "Bride" here goes above and beyond, integrating Mario into her special day to such an extent that the lucky man will need to show up to every anniversary with diamonds to even begin to deserve her. "I had found pics of a very similar cake online, and it inspired me to create my own Mario cake and surprise my groom on our wedding day (November 5th). My groom is a professional video gamer, and his favorite game is Mario cart. We were married in Vegas, so I had the bottom tier a desert theme, and I went with the old school Peach Castle rather than a modern one. I'm brunette, and my groom a blonde, so I had them customize Peach and Mario accordingly. The only hint I gave my groom about the cake was I had a pair of Mario boxers delivered to him to wear during the ceremony the morning of the big day, and then I had our rings brought forth by the ring bearer on a 1-Up key-chain which later snuck itself into my bouquet for the rest of the day. The entire cake was edible, the desert tier was berries and creme, the galaxy was bouncy chocolate with chantilly cream, and the castle (which has been preserved in my freezer for the 1 year anniversary) is peanut butter chocolate. I hope you post the pics on your site, so your readers can find more inspiration for their own wedding creations!" I don't know who her husband is, but if he ever hurts her there'll be a slew of gamers waiting to take his place. Line forms at my back, ladies and gentlemen.